Receive a FREE audit: Where can you you save with your power sources? Long lifetime stands out as the number one benefit of LED lights. LED bulbs and diodes have an outstanding operational lifetime expectation of up to 90,000 hours. This is about 10 years of continuous operation, or 20 years of 50% operation. LED’s are different than standard lighting: They don’t really burn out like a standard light. Lighting diodes emit lower output levels over a very long period of time and become less bright. LED’s provide illumination and lighting, with an estimated energy efficiency of 80%-90% when compared to incandescent lighting and fluorescent light bulbs. This means that about 80% of the electrical energy is converted to light, while only 20% is lost and converted into other forms of energy such as heat. 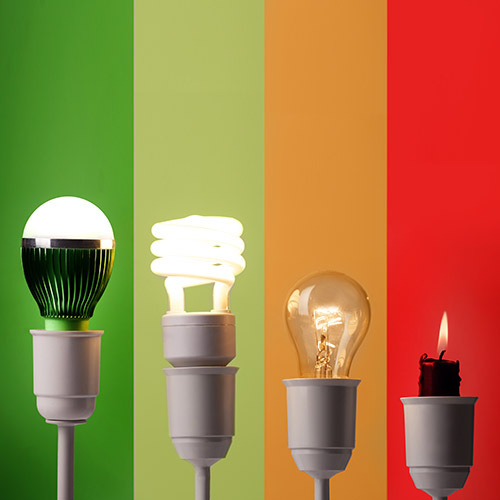 Incandescent light bulbs typically operate at 20% energy efficiency and 80% of the electricity is converted into heat. Because the long life span of LED lights, the savings in maintenance, labor and inventory is tremendous. LED lights are free of toxic materials. Most conventional fluorescent lighting bulbs contain a multitude of materials such as mercury, lead, cadmium and gas. LED lights contain no toxic materials and are 100% recyclable. The long operational lifetime span of one LED light can save material and production of up to 25 incandescent lights. LED’s are extremely durable and built with sturdy components. LED lights are resistant to shock, vibrations and external impacts, they are used in outdoor lighting systems for rough conditions and exposure to weather, wind, rain or even external vandalism, traffic related public exposure and construction or manufacturing sites. LED illumination produces little infrared light and almost to no UV emissions. Because of this, LED lighting is highly suitable not only for goods and materials that are sensitive to heat due to the benefit of low radiated heat emission. LED illumination of UV sensitive objects or materials is perfect for museums, art galleries and archaeological sites. LED’s may be shaped to produce highly efficient illumination. Individual LED’s may be dimmed, resulting in a dynamic control of light, color and distribution. Well-designed LED illumination systems achieve fantastic lighting effects, not only for the eye but also for the mood and the mind. LED mood illumination is being used in airplanes, classrooms and retail locations. LED’s are ideal for operation in cold and low outdoor temperature settings. LED illumination operates well also in cold settings, such as for outdoor winter settings, freezer rooms and commercial refrigeration. LED is designed to focus its light and can be directed to a specific location without the use of an external reflector. LED illumination systems are able to deliver light more efficiently to the desired location. There is also not flicker, buzz or hum to these lights. LED lights turn on immediately. LED lights may switched off and on frequently and without affecting the LED’s lifetime or light emission. In contrast, traditional lighting may take several seconds to reach full brightness, and frequent on/off switching does drastically reduce operational life expectancy. A low-voltage power supply is sufficient for LED illumination. This makes it easy to use LED lighting also in outdoor settings, by connecting an external solar-energy source and is a big advantage when it comes to using LED technology in vehicles, and remote or rural areas.